Board index Developer's Corner News Survarium Patch 0.56 is Live. Play Now! Survarium Patch 0.56 is Live. Play Now! Discussion of the latest news and events related to Survarium. Survarium Patch 0.56c is now available! Launch Survarium to download and install the patch. Read the complete list of changes below. See you in the game! Also read the list of changes in Survarium patch 0.56b in case you missed it. - Now you won't receive a penalty in Team Missions for leaving or being inactive. - Silver penalties received for leaving a PvP match or being inactive in a PvP match are now also displayed in notification (in the lower right corner of the lobby screen). - There is now a final round in Team Deathmatch mode: when one of the teams has only 8 respawn points left (skulls displayed), the remaining match time is reduced to three minutes. - Added a star to the icons of the following rare weapons: Glock 17, SR-2M Veresk, PP-91 "Kedr", RPD, Fort-401, PKP "Pecheneg", Franchi SPAS-12, Remington 870. - Now module stats are displayed when you hover a cursor over its icon on the Treasure Hunt screen. - Updated the music that is played 30 seconds before the end of a PvP match. - Reintroduced win/loss music that is played when a PvP match ends. - Usual faction equipment prices are back (the prices were temporarily reduced after the Faction Challenge event). - Fixed an issue causing some allies not to be displayed in the voice chat block/unblock window. - Fixed an issue when Glock 17 did not belong to any faction, and Glock 17 "Desert" belonged to Scavengers. - Fixed an issue causing loading screens to duplicate and overlap. - Fixed an issue when an incorrect bonus (30% instead of 25%) was displayed upon activation of the Spring artifact. Last edited by joewillburn on 24.01.2019, 13:08, edited 2 times in total. yeah, I praised the game for amazing MM some time ago but VG managed to "fix" this. now I cant win a damn match again. Starting at 9 AM GMT tomorrow, January 25, the game servers will be temporarily unavailable due to the installation of Survarium 0.56c1. The expected downtime is about an hour. We will let you know as soon as the servers are back online, so you are able play the game. As usual, players with premium accounts affected by the downtime will be compensated for the length of maintenance. Read the list of changes in the update below. Also read the list of changes in Survarium 0.56c in case you missed it! - There is now a final round in Slaughter mode: when one of the teams has only 8 respawn points left (skulls displayed), the remaining match time is reduced to three minutes. - Fixed an issue causing weapons to inflict more damage than intended. Nice needlepoint. Can you make a beanie for the next in-game event? Recent patches have done nothing to do with balance or delay or sync or what have you. So it must be a case of data between you and the servers. Note too, yesterday's patch introduced a bug which increased all weapons damage by 50%. Which we are correcting with today's 56c1. Last edited by joewillburn on 25.01.2019, 10:33, edited 1 time in total. Survarium Patch 0.56c1 is now available! 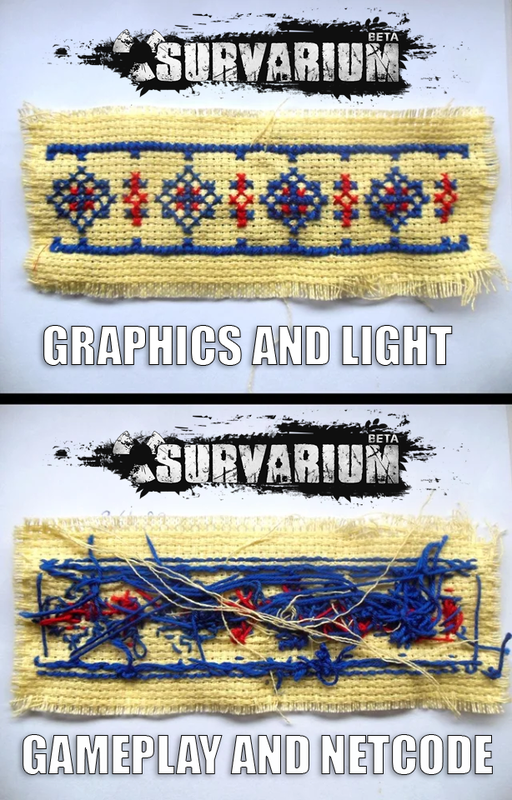 Launch Survarium to download and install the patch. Read the complete list of changes below. See you in the game! Also read the list of changes in Survarium patch 0.56c in case you missed it. Last edited by joewillburn on 25.01.2019, 12:27, edited 1 time in total. I asked it many times, why with a scope it's easy to kill, and with a collimator it need a lot more bullets ? I've never had any answer. And i can confirm that since a few updates it's near always packet loss and instable ping, many EU players complain about this in matches. The worse is on the new map, and in PVE. Some of them gave a new name to the game : packet loss academy. In my case it's not my connection that is totally good in any other cases (download, streaming, pingtest, speedtest and else). Last edited by ike07 on 25.01.2019, 12:19, edited 4 times in total. I've been doing pretty decently lately and my ping is still the same. Around 200. Joe a quick comparison between players with low delay and all the others will reveal something strange. Most low delay players go fo smgs with a very high HS/kills ratio or collimators because of its effectivness. To me its impossible to use collimators...I cant kill anything when using them. For low delay players, collimators r very efficient. Dont understand why!!!! Its like hitreg is better when low delay players use collimators. Look at all matches. Almost all players use scopes and almost all low delay players use collimators. And in almost all cases collimators combined with low delay, get the best results. I honestly dont know whats happening. Why low delay players can use collimators and others cant??? Why the insane HS/kills ratio when using smg??? Why the scope fest for players with delay of 60 70+???? Why I get easy kills with scopes and no kills whatsoever with collimators regardless of distance???? Im almost 4000 ELO so I dont complain because I loose. Im just stating. Everyone on general chat wonder about same things. I hate scopes and I love collimators but I cant use them. Why???? Its weird...whats going on?????!!!!! R devs aware of all these??? Cant they justt see the issue here??? Last edited by da_capo on 28.01.2019, 13:15, edited 1 time in total. According to you low-latency means better results in match, thus - higher score. According to our stats players with 150 latency receive ~10% less score than players with 50 latency - which is definitely not "completely owned"
Joe a quick comparison between players with low delay and all the others will reveal something strange. According to you most low-latency players use SMG and get insane score. According to our stats less than 10% of kills were from SMG's and this number stays the same for all players - there is no correlation between weapon class and latency. So I am afraid afraid quick comparison like you asked for does not reveals anything strange. ivan, maybe I wasnt clear enough. Its not about delay per se. its just weird that most low delay players go for smg and collimators - and have high scores - while the others cant. smg have collimators and I see them only on short maps, while collimators I see them only used by low delay players no matter the map. by "completely owned" I mean only if low delay players use smg or collimators. I can clearly see low delay players getting extremely high scores only when using collimators or smg. same players go back to normal score if the use scopes. and thats the case: why I cant use collimators???? why cant I get kills when using collimatos???????????? I kill extremely fast with scopes, regardless of distance and cant kill anything with collimators???? cant u see the issue?? its obvious...everyone see it. Last edited by da_capo on 28.01.2019, 18:32, edited 8 times in total. Its not about delay per se. Then why you've mentioned word "delay" 8 times in your last post and 14 times in this one? Have you considered possibility that this has nothing to do with latency but with (for example) skill? And by "skill" I mean no just experience with game in general but specifically experience with this precise weapon configuration? Both Swyp and Dreamchaser_ have spent thousands of hours in game. I am pretty sure that this factor is much more important than latency. Source? I can't see anything like that in general chat. Ru players have clear advantage over others thats just truth. I have played more than 3 years now almost daily. I know how things are. https://survarium.pro/matches/12716421 Lua player was unkillable or I find it really hard to believe zubr makes it magic. timo-53800: Ru players have clear advantage over others thats just truth. I have played more than 3 years now almost daily. I know how things are. https://survarium.pro/matches/12716421 Lua player was unkillable or I find it really hard to believe zubr makes it magic. was he using collimator or smg??? what was hes delay?? ivan_vg: Its not about delay per se. man, the only thing Im stating is that players of 70+ delay CANNOT USE COLLIMATORS. I dont care about delay or skilled players. Im just saying that only low delay players can use collimators. very skilled players use scopes if their delay is over 70 80. they dont get kills when using collimators. its not really about delay but about game play mechanics. Im not crazy and there was no issue like this before. I used to perform very very well before with collimators and now I cant. i was top 100 every damn league. I repeat, its something weird and wrong with weapons mechanics. I cant get kills with collimators and I get VERY VERY EASY kills with scopes. only low delay players can use collimators and just because they use collimators they get insane HS/Kills ration and high scores. do u understand man??? matches r scope fest and only few players use collimators and only if they r low on delay. I WANNA BE ABLE TO USE COLLIMATORS AND I CANT. its something strange. Last edited by da_capo on 28.01.2019, 19:56, edited 5 times in total. Last edited by timo-53800 on 28.01.2019, 20:17, edited 2 times in total. da_capo - I use a collimator and I have high delay. I kill russian players and other players with just the same ability. I notice no difference between player locations and ability to kill. In order to reply you must be signed in.